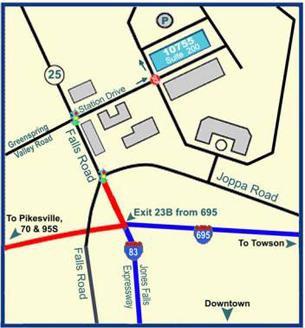 Conveniently located at the interchange between the Baltimore Beltway and the Jones Falls Expressway, Park Medical Associates in the Johns Hopkins at Green Spring Station Pavilion 1, is just minutes from downtown Baltimore, Columbia, Hunt Valley, Pikesville, Owings Mills, and Towson. Take exit 23B off the Baltimore Beltway and continue north on Falls Road to Green Spring Station at the intersection of Falls and Joppa Roads. 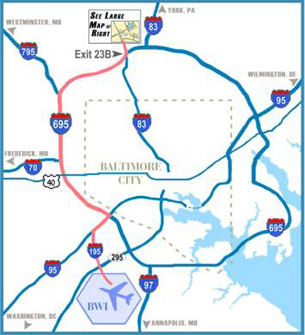 From the city, drive north on the Jones Falls Expressway (I-83) past exits to 695 E & W until the Jones Falls Expressway becomes Falls Road (Rt. 25). Go 1/2 mile to Green Spring Station which begins at the corner of Falls Road and Joppa Road. Proceed to the second traffic light and turn right onto Station Drive. Continue to the four-way stop and Pavilion I will be directly in front of you on the left. A shuttle service between our office at Green Spring Station and the Johns Hopkins downtown campus operates every half hour, Monday through Friday. For those using public transportation, the MTA"s M10 bus stops on the Green Spring Station campus. To print a copy of the map and directions, click here. Click here to download Adobe Reader® software free in order to view and print Adobe PDF files.